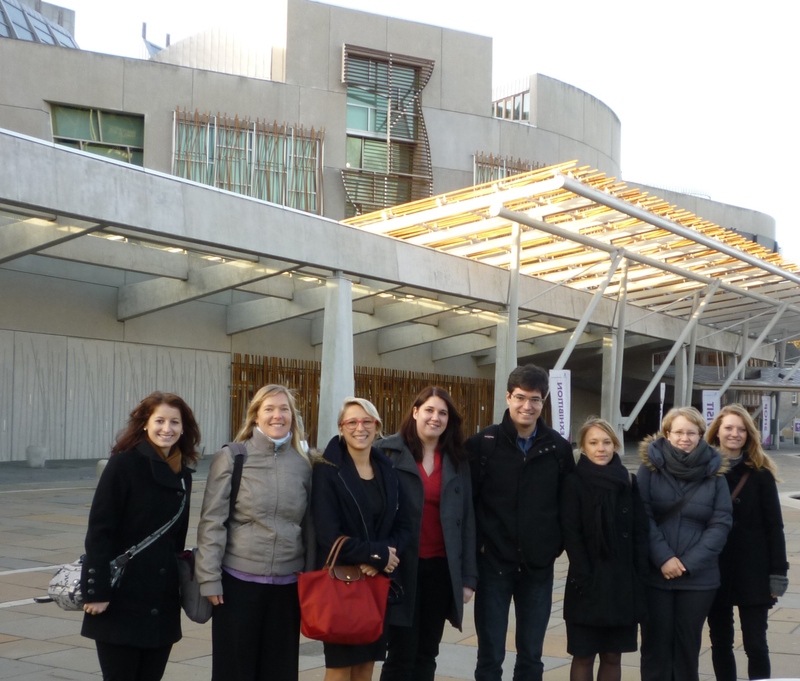 For three Thursdays in a row, Heriot-Watt MSc students from the Translation and Conference Interpreting course have had a unique chance to hone their skills in a professional booth at the Scottish Parliament. With the help and support of Roberta Bianchini, Office Manager to Colin Keir MSP and a graduate from the M.A. 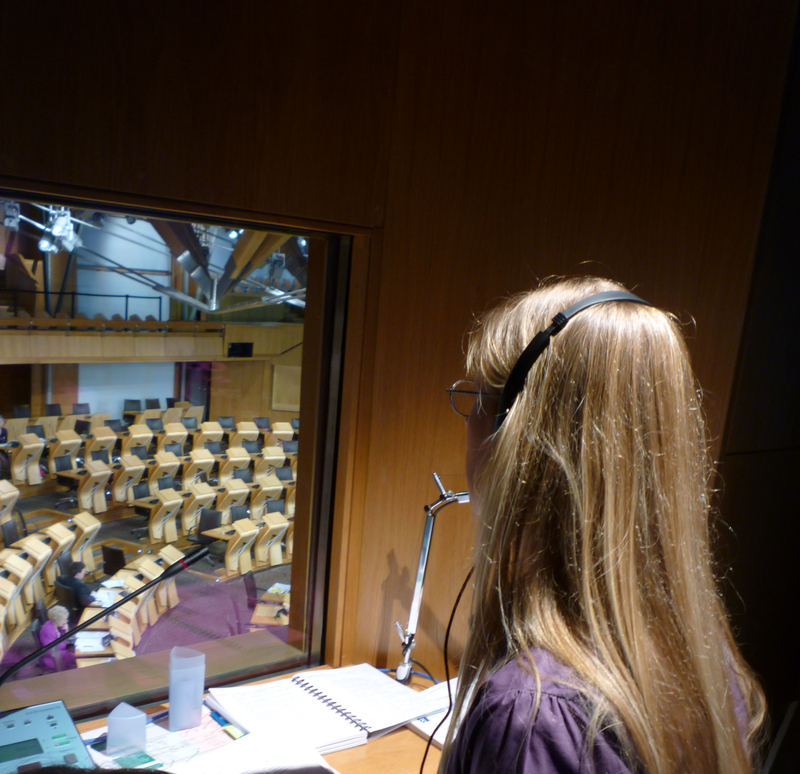 in Translation and Interpreting herself, a scheme was put in place in cooperation with the Scottish Parliament, enabling students to test their skills from real live parliamentary discussions, similar to what professional interpreters tackle on a daily basis in any multilingual organisation. The microphones remained switched off, as is the usual practice for dummy booth sessions, and the students’ performance was monitored by members of staff who accompanied them and sat with them in the booth. Thanks to the excellent facilities, a number of students were able to work together in the professional interpreting booth, practicing various techniques: simultaneous interpreting into French, Spanish, German, Arabic and Chinese, from the live speeches happening below, in the debating chamber, but also chuchotage (also called “whispered interpreting”) into English. Student feed-back was very positive and enthusiastic. One of the students said: “It was a great hands-on experience! It was really interesting to discover a real professional setting and working-space, and also to see how the parliamentary debates work”. On top of giving students valuable hands on experience, the aim of this session was to help students become more aware of what they need to focus on at this stage of the learning process. The message seems to have sunk in. As one student said “it allowed us all to figure out in more detail where our weaknesses lie and I know that we will all be working hard in the weeks to come to find solutions to them”. 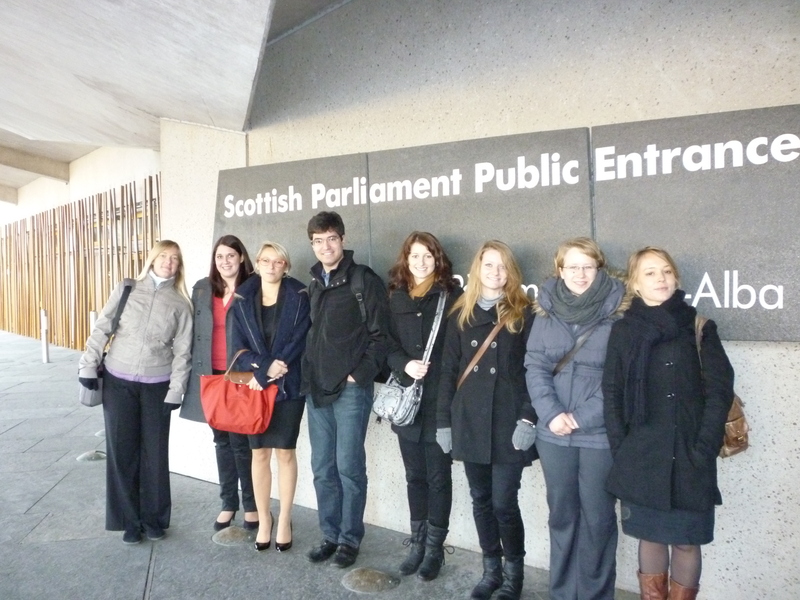 Each student left the Parliament with a clearer idea as to the progress they still need to make to be fully ready for the professional world, and most importantly, how they could use class materials and live resources like the broadcast of Holyrood sessions to perfect their technique. This session form part of the extra events arranged by Heriot-Watt in order to help students become ready for the demands of the job market. In March, many of these students will be interpreting for real at our Multilingual Debate (editor’s note: more info available shortly). On Burns day (25th January) Heriot-Watt had a visit from Dr Julie Boéri of the Universitat Pompeu Fabra in Barcelona for her lecture on the Sociology of Translation and Interpreting. Dr Boéri took us on a journey from the Nuremberg War Trials to World Social Fora to explore just how interpreters see themselves and their profession. Her main objective was to explore whether the world of professional interpreting, with its fixed standards and inherited traditions was in opposition to the world of activism, with its disregard for rules and attempts to build something different. In court interpreting, as we discussed last week, these worlds sometimes meet. Professional and social concerns can and do merge into one when the profession seems to be threatened. In conference interpreting, on the other hand, long-term strategies for increasing the status of interpreters, led by AIIC (the International Association of Conference Interpreters), have tended to emphasise how interpreters need to build up a repertoire of complex skills. It wouldn’t take long for them to say that the only place to obtain these skills was in a university that had AIIC-approved experts doing the teaching. The profession was then built on the model of people gaining expertise by learning from experts. As ever, things aren’t quite as simple as they might seem. Apparently, there are many professionals who choose to work for BABELS, an activist organisation offering volunteer interpreting, and many other professionals who choose to donate some of their time to NGOs. This means that volunteer interpreting is not necessarily worse than paid interpreting and neither does paid interpreting have to mean that the interpreter is not committed to what they are saying. Perhaps the real problem then isn’t the barrier between paid and volunteer interpreting but between “professional” (i.e. neutral) interpreting and “activist” interpreting. Even here, I am sure readers will be able to think of examples that see the two merged together. What would we call it if a committed environmentalist was paid to interpret for a large ecological NGO? Would they see their role as the neutral professional or would they be an activist, simply because they support their client when they are outside the booth? Is it even reasonable to say that interpreters can ever be truly neutral? Don’t all interpreters enter the booth with pre-conceived ideas and preferences that will always appear somehow in their output? How do you see yourself? Are you an activist translator or interpreter? Do you think language professionals should always be neutral? Do you know or care how your clients see your role? As always, we look forward to reading your comments. And in the current Times Higher Education magazine, Sir Adam Roberts, as befits his position, is keen to reinforce the value of studying the humanities (including languages) and social sciences: “In a fast-changing world, the flexible skills offered by rigorous study in the humanities and social sciences are of enormous value, and this will be understood in time”. Amen to that. Why does they feel the need to comment? Well, the number of UK university applicants is down by 7.4 per cent relative to this time last year. This, Roberts states, “will reinforce certain worries about the new funding regime – especially as they affect the teaching of languages”. In particular, applications to European language courses are down by 11.2 per cent and those to non-European languages are down by 21.5 per cent: both decreases are well above the average decline across all subjects. Here we go again, eh? Why is that, even when the arguments are articulated in every language known to humankind, in the UK the message does not seem to register that it is massively in the national interest to ensure the sustainable, high-quality linguistic capability of our population (and especially our workforce)? If the splendidly isolationist English-is-enough position beloved of many Britons were ever plausible, it is becoming less so by the day. Why? Because linguistic power goes hand-in-hand with economic strength. Hutton has it exactly right: the waning dominance of Europe and North America in the global marketplace will, as night follows day, be associated with a realignment of linguistic pre-eminence. Any sociolinguist worth their salt can tell you this. What happened to Cornish? The money moved to the capital cities and those who wanted to earn it needed to adapt to metropolitan language practices. So it will be on the global scale: for Cornish, read English; for London, read China. When did we become so blinkered about the needs of the economy – “look after the STEM subjects, they’ll drive regeneration” is a message we hear like a broken record – and so complacent about language? Even the much-derided Research Excellence Framework in the UK’s universities recognises that 20% of the value of research is associated with its impact – and how will you generate impact without communicating the benefits of your work to purchasers in a language they understand? What’s more, if we need new ways to stimulate the global economy (and we plainly do), and if there is any relationship between language and thought (and there plainly is), then understanding how different languages are used in and for the process of thinking must be utterly vital to planning for the world ahead. It’s a big world and we need to talk with it and think with it. Humans learn languages best in their youth. There’s more to life (and to business) than STEM. No-one should need to spell out what we have to do: it speaks for itself.